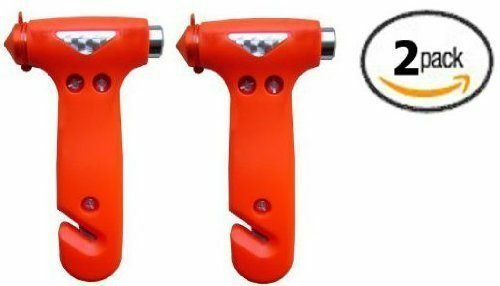 Seatbelt Cutter Window Breaker Escape Tool Just $5.89! You are here: Home / Great Deals / Amazon Deals / Seatbelt Cutter Window Breaker Escape Tool Just $5.89! Head over to Amazon and get this Seatbelt Cutter Window Breaker Escape Tool 2 Pack for just $5.89, down from $19.95. The Emergency Tool helps you to escape quickly after a car accident. Many people fear wearing a seat belt in case they were to be trapped in a burning or sinking vehicle. Electric windows do not work without power and would need to be shattered so you could escape. The surgically sharp blade effortlessly cuts through a tangled seat belt (recessed for safety), the pointed steel head (with red plastic protective cover) easily shatter windows. Simply keep it in your glove box.